Hikers and campers recognize the cairn as more than just a pile of rocks--historically used as a pre-war ceremony in Scotland, they've now come to serve as a simple reminder that the path you're walking has been walked before. 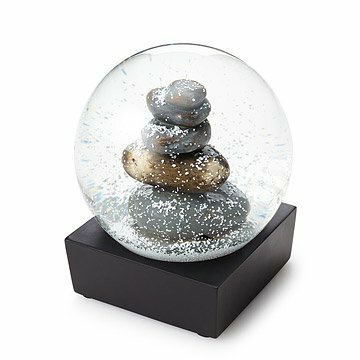 This symbolic gesture of togetherness takes center stage in this beautiful snow globe, an inspired token for nature enthusiasts or your favorite trail blazer. Made in China. Do not expose globe to extreme hot or cold temperatures. Do not place near windows or in direct sunlight. This item is not a toy. Contents may be harmful if swallowed. Bought this for my sister to add some peace to her new office space. She loved it. Love snow globes during the holidays - and we are a hiking family - so this is perfect. This snow globe is gorgeous! It is well constructed, simple, and very zen. Unique gift with quality design and construction. This quality product is being enjoyed by the receiver! We travel a lot and always pick up rocks to make "Hoodoos" for our backyard. When I saw this snow globe I knew it was the perfect gift for my husband. He will have a hard time trying to out do me on this gift. Here is a new idea for you, how about a single palm tree inside a snow globe? We would love to own one. I was so happy to find this item in your catalog! It was sold out at the first source I found. Love this reminder of my heritage - it is simple and a good conversation starter. Customer service was terrific arrived well ahead of time. We thought this would be a great gift for neighbors who build cairns but we were disappointed. The snow looks terrible. Later we saw similar globes at far less price.